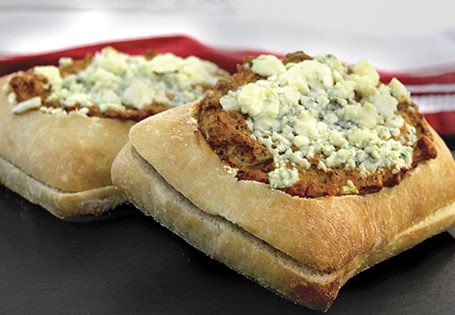 Spicy cream cheese dip, stuffed into warm ciabatta bread rolls. In medium pan, heat the oil over medium heat. Sauté onions and garlic until onions are translucent. Season with chili powder, crushed red pepper, salt, black pepper and onion powder. In a medium bowl, combine hot onion mixture, cream cheese, sour cream, hot sauce, Sriracha and green onions and mix until thoroughly combined. Using a small knife, cut out the center of the top of the ciabatta bread rolls and discard. Place rolls on a baking sheet lined with parchment paper. Fill each roll with cream cheese filling and top with blue cheese crumbles. Bake in oven for 10-15 minutes or until cheese begins to bubble. Remove from oven, allow to cool slightly and serve. TIP: To make the dip less blazing hot, just cut the amount of hot sauce and sriracha by half. If that’s still too hot, cut it back to an amount that’s comfortable for your palate.